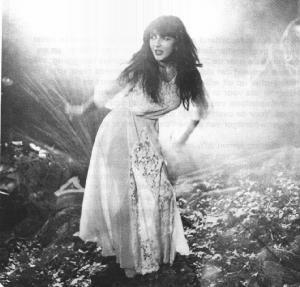 To promote the new haunted castle of the Dutch theme park Efteling, Kate Bush was asked to for a TV special of her album "the kick inside". Kate was 19 years old at that time. The special starts with a special made tombstone covered with leaves. Then the wind blows the leaves away revealing the name "Kate Bush". 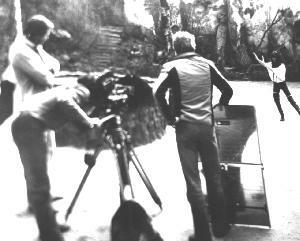 The song moving is recorded with Kate dancing outdoors in front of the haunted castle. In the back we see the entrance of the castle. Some of the air shots were made with a crane that is visible in the background in a shot 2 minutes from the start of the special. The song is recorded in the main show of the haunted castle. The public sees the show behind a big glass wall but for the special Kate performed in the show. The show takes place in the courtyard of a medieval monastery. The courtyard is full of tombstones. On the left there is a chapel. In the middle there is a passage where the ghosts of monks walk. On the right is a sarcophagus where the song starts. On the fist notes of the song the sarcophagus opens and Kate climbs out (see picture). She is wearing a long white dress and walks between the tombstones that move on the music. A touch of smoke is added in this special for extra effect. Then we see Kate dancing in front of the passage in which the (mechanically operated) monks walk. In the following shot the camera is placed in front of the passage and films to the left where we see Kate dancing with a pile of moving skulls behind her. The following shot is superb. Through a hole in the ground in front of the passage we can look into the catacombs. During the normal show the public sees there transparent ghosts chasing each other. The ghost are transparent because the public looks at a reflection in a big glass wall. The real ghosts walk out of sight. Because of special lighting the glass wall in the show works as a mirror. For the shots in the Kate Bush special, the ghosts are replaced by a dancing Kate. The camera films her glass reflection and therefore we see a transparent Kate dancing in the catacombs. The next shots are with Kate standing on the attic above the sarcophagus and between the thombstones. The song ends with a moving gargoyle that is located on the construction around the sarcophagus. This song starts in the pre-show of the haunted castle. There is is a big Indian type giant. He sits cross-legged and he has a big crystal ball in which, during the normal shows, the face of a woman appears which transforms into a skull. This effect is also a glass reflection, like in the catacombs of the main show. Only here the original heads are placed on the ground in front of the giant and reflect via big glass placed under 45 degrees in front of the giant (same principle as an autocue). For the Kate Bush special we see Kate reflected in the ball as she sings the song. On a certain point in time she bursts into laughter and can't continue to lip-syc. I can imagine this when I think of her position. She must be laying on the ground in front of the giant with her knees withdrawn and with bright lights in her face. In this situation i agree that it must be hard to concentrate on your performance! The next shot is recorded in the fairytale forrest where we see Kate in front of the entrance of the Indian Waterlilies attraction. In front of the entrance there are two giant Indian temple guard statutes. Kate dances between them. The following scene shows Kate again in the main show of the haunted castle. She is on the attic above the passage with the monks. There three old men swing from left to right. Normally it's only the three of them but in the special Kate joined them and it seems like they dance with her. This song is recorded with Kate sitting on her knees in front of a pond with swans (today the rapid waterride is located here). A soft focus circle is added in some of the shots as extra effect. This song starts again with Kate in the crystal ball but now finally the camera zooms out so we can also see the giant that holds the ball. The next shot shows Kate in the corridor that goes from the entrance of the castle towards the main show. Using TV tricks a mirror image of Kate dances with her. On the wall in the back we see a torch. Then we see Kate halfway the corridor in a room where a giants arm comes out of the ceiling. The giant holds a big chandelier with his forefinger. He swings the chandelier back and forth. Strange men with bat wings appear now and then on the transparent ceiling. Kate wears a red glittering magicians outfit with a black hat and she takes a string of coloured "handkerchiefs" out of her sleeve. Another shot shows her dancing in front of the giant with the crystal ball which is located just after the room with the chandelier. Other shots in the song are taken again in the beginning of the corridor. An interesting detail is that we see an empty niche with blue light in it. Today, moving skulls can be seen there but apparently they were not ready at the time of the recording (the show is recorded before the castle was opened to the public). This song shows Kate in a rowing boat that serves as a coffin. Her hair is painted grey and she wears a black dress with a back veil. Kate is surrounded by red and white flowers. At the end of the song she pulls her veil across her face and "dies". Then the boat floats on the pond. More information about this special can be found HERE. The colour pictures are also from this site.